What does one do with a day when there is nothing on the schedule but "regular" things like work-work and dishes and laundry? Well, of course, they go stand in line for hours for a 20-second chance at fame and a million bucks! Monday evening my new friend Jen called. She had a crazy idea and wanted to know if I was game...almost literally. Deal or No Deal was coming to a mall about 45 minutes from here for open auditions on Tuesday. Did I wanna come along?? I just had to giggle...this girl is crazy fun! I thought for a moment, realized I didn't have any truly pressing issues to handle between 1 and 4 pm the next day, so I thought, Sure, I'll come along and see what happens. First there was the application, which we printed from the online link (which is now gone or I'd link ya). The questions were about lucky moments in our lives, what made us interesting, embarrassing stories, outrageous things we've done, etc. I labored over this paper most of the evening, writing it over and over so that it would be mistake-free. I learned two things: I don't do enough hand-written work anymore to keep up my skills, and I am not all that interesting or anywhere near outrageous. Eventually, I settled on answers, completed the form cleanly, and went to bed. We met at Jen's the next morning at 10:30 am. The event itself was from 1 to 4 pm, with the doors opening at the mall that morning at 5:30 am. What??? Why were we even bothering? And we were taking three children with us! Are we nuts? Possibly so. But after packing Jen's van full of strollers, snacks, diaper bags, kids, and us, we headed out. We found out that morning just before we left that our friend Amy from Larkin's Place was heading over too. (Here's her take on the day. Hilarious!)) She was smart enough to leave Larkin with her MIL but took her son Chase (even skipping school!) to enjoy the fun. She was ahead of us by about 30 minutes, so when she got there she gave us the low-down on the situation, so we planned accordingly. 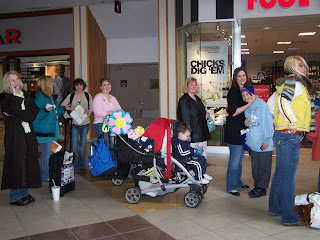 The line was around the outside of one end of the mall, that was the first report. It was like 38 degrees, very windy, and looking like it might rain. We knew right away we couldn't just jump in line with these three kiddos. And of course, for some odd reason, we didn't dress warm enough to wait outside... or really to stand and wait at all. We looked cute in our boots and sweaters, though! We parked and went into the mall to see what the story was. The strollers were unfolded and loaded up. 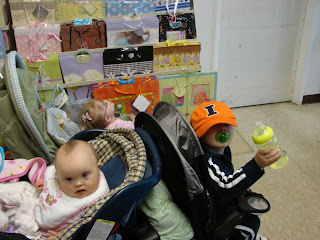 Sophie--8 months, Alexander--3 years, and Braska--16 months...they were strapped in and ready to charm. Jen and I walked in at the point where the line went into the mall from outside, right next to JCPenney. It went into what I call a corral, the back-and-forth maze like you see in front of the ticket counter at the airport, except this one was HUGE. From the corral, the line went straight down the middle of the mall, all the way to the other end. (Here's a map of the mall, for you visual detail people.) At the Bergner's end, there was an even larger corral, way larger, and then at the end of the corral, groups of 10 were lined up in 8 lines that were each taken in one group at a time. I was surprised at how fast the line moved, relatively, once the kids and I joined the group. It was fairly consistent movement until just after we entered the final corral at about 5:15 pm, when we figured they took a break for dinner. Things stood completely still for about 30 or 45 minutes. Then it went quite quickly through the last of the corral. Amy's sister, Penny, was with us on and off through the afternoon, and she hung with us through the corral. Being the saint she is, Penny, with help from Chase, took the kids and strollers to the side as we got to the end of the corral and were herded into our lines of 10. Amy was first in our line, then Jen, then me. We waited as the other groups of 10 were called to a table, they all talked one at a time, then they left, sometimes a few stayed behind. Right as we were about to get called up, Jen turned around and said, "Let's bail! Let's just go right now!" But it was too late, Amy was already heading toward our table and we followed. We walked up to a table with a nice young lady standing behind it. We all settled in and around so that everyone could be seen. After we set our applications on the table, the young lady told us we'd each have 20 seconds to "sell ourselves." What in the heck do I say in 20 seconds to convince anyone I should be on a game show?!? 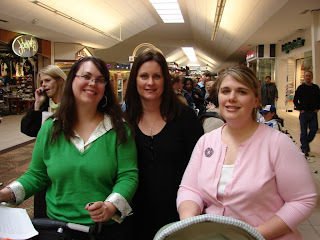 Amy started, she's a Momologist (a word she's coined), former flight attendant, plus she has that X-factor personality. The young lady showed interest immediately at Momologist. Then it was Jen, who jumped in with "I had a baby in a moving vehicle!" She also threw in her line about climbing a mountain in Russia in a bikini. And she's darn cute and perky! I'm out...can't compete...what do I say? My mind was racing. Then it was my turn. I was standing there holding Braska. (She was on the brink of overstimulation with all the people and noise at this point. I didn't think it was fair to send her with people she hadn't met while I went in.) The young lady looked at me, as if to cue me to begin, so I did. And what I said, I don't fully remember. I remember something about being a mom even though I hadn't planned to be. Having a daughter with DS. Being crazy enough to marry a guy named Muncher and name my daughter Nebraska. It was a blur. Then I paused, and the next girl started. I just stood there. What a dork I am! I am so freaking lame! I couldn't come up with anything at all. After the rest of the people at our table did their thing, none of which I could hear in the din of the big room, the young lady pointed at Amy, Jen, and a couple others at our table to stay for further questions. The rest of us were pointed out and around and back to the mall area. I found Penny and Chase and the kids waiting and told them Amy and Jen had been kept for round 2. We waited just a bit, then Amy emerged. She told us Jen had been kept for round 3! Round 2 had consisted of another 20 seconds, basically, then a second person jumped in with the young lady and they had 10 more seconds. Then Jen was chosen to move on. She called from in there a few minutes later. They'd been sent to a little curtained area with a small corral to wait for the next "interview." She waited, as did we, for an hour. She finally came out with us at 7:55 pm, saying when she got to the front of the line, they took another group of 10 and had the 20 second thing all over again. By this time, her pep had waned and she was a little glassy-eyed from waiting and freaking out over the whole deal. They had told the group in the small corral that this was the last room...but we're a bit suspicious if that was actually true. There were hugs and goodbyes, and we headed to the van. Jen was cracking me up because she just couldn't believe she'd gone through the whole thing and gotten so far. In the end, none of us really know anything. The show takes all the applications and goes through them to see if they want further info from a person based on that. They could very well call Amy or Jen. It would not surprise me. They won't be calling me, and that's ok. Could I use the money? Absolutely! More than you know! But I am just not cut out for that kind of thing. It makes me think back to college, when I was the life of the party and a crazy personality, and realize that life has changed me. I'm ok with that. I just won't be a contestant on Deal or No Deal. We pulled into Jen's driveway at about 9:15 pm I think. Her husband Mark came out to get the kids. Jen got out to go inside and left the van running. That's how fried her brain was! I just had to laugh. A crazy whim of an idea at the start, and actual shot at the show by the time the day's over. Go Jen! Win the million!! Here's some pics from the day. Jen went out to the line initially "for a while" so we waited just inside the doors by the JCPenney customer service desk. Kudos to these kids. They were angels. Alexander was SO well-behaved all day. He should get a new train or something, Jen! This is us...Jen, Amy, and me. See the lady behind us on the left, talking on her phone. Yeah...she did alot of that, talking. Us in line...Me and the kids, Amy and Chase together on the right. While we were at a standstill in the corral, I took the chance to feed Braska. It drew some attention, but everyone was super great. The kids got so much positive attention from people around us all day. Overall, it was a cool experience. I'm glad I went. I'll never say I didn't try. And I really hope one of my girls gets the BIG call! Be watching for updates! Wow, I didn't realize how much was involved to be a contestant. It sounds like an exhausing day. I can't even stand waiting in line to see Santa, so I never would have been able to do it. Hey, ya never know, you could still have a chance w/ your application. How cool would that be if one of you did get pick! that sounds like a great adventure - and you braved it with the kids...I would have bailed. I know I'm not interesting enough for those things either - I once had to play a game where you wrote down 2 truths and a lie about yourself, then the three things would be read off for others to guess which is the lie - well I agonized over that thing forever, just didn't have anything fun about myself to write - can't imagine having to fill out a whole application! You are brave. I wouldn't have done that in a million years. I would have been scared stiff. Jessie--We were just plain crazy for taking the kids, but it worked out, thank God! Carole--I don't know about brave, maybe just loopy. WoW you have a lot of patience! The Deal or No Deal people were around here earlier this week, too! I heard about it too late, not that I would've had the patience to stand in line that long! Glad it was fun! Wow! You are brave - it sounds like an exciting but an exhausting day! It was fun to read your experience. Deal or No Deal was in our area on Wednesday this week and I wondered what it would have been like if I had gone. It was even more crazy than I had imagined and I know I would have been SO lame as well. I give a lot of credit to those people who can sell themselves. Sounded like you had fun though. Michelle--If I hadn't had the crew to keep wanting to stay, I'd probably have bailed. Melanie--The most interesting part was the people who THOUGHT they could sell themselves but were wrong. At least I already KNEW I didn't have a chance! That's too funny! I'm glad you went. And the pictures are great. You look like you should be on TV! You rock!! You are a winner to me, RK!! I used to be the life of the party too. Not so much any more. I do good to put a sentence together that makes sense!! Now you have a memory to last a life time!! Andrea--You are one of very few who can at least vouch for the fact that in my younger days I had pep and a bit of pizzazz! They didn't call me Sprite for nothin'! Hey! I know that face!